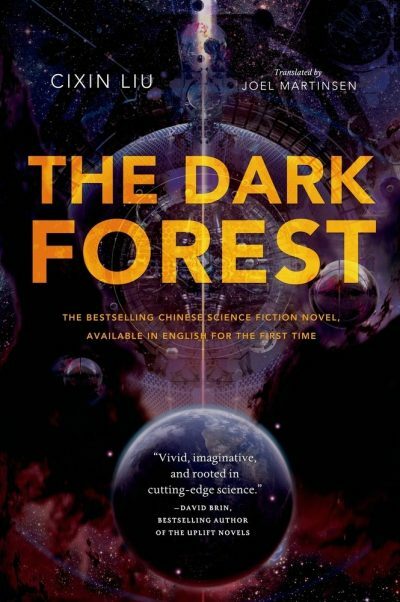 2015’s The Dark Forest, originally published in 20081 as 黑暗森林, is the second volume of Cixin Liu’s Remembrance of Earth’s Past trilogy. It follows Liu’s 2006 (for the Chinese edition)/2014 (English edition) novel The Three-Body Problem. Three-Body Problem won the 2014 Hugo, despite notable handicaps. Not only had a translated book never before won the Hugo, two bloc-voting schemes conspired (knowingly or not) to keep it off the ballot. Only the fact that Marko Kloos withdrew (for reasons explained here) allowed Three-Body Problem onto the Hugo best novel ballot. That is a nice story of triumph over great odds, which is rather suitable considering that Three-Body Problem is a story of humanity facing a seemingly insurmountable challenge: resisting extermination at the manipulating appendages of the technologically superior Trisolarians. It’s a bit of shame, therefore, that I was somewhat ambivalent about Three-Body Problem2. Many of the same issues coloured my reading of the sequel. To a first analysis, humanity appears to be doomed. Not only are the Trisolarians far more technologically advanced than we humans, but their intelligent subatomic particles, the sophons, not only keep the aliens apprised of every observable thing that humans do, but also prevent human science from advancing in any way. The fact that various factions on Earth have convinced themselves that humans deserve to be wiped out and have allied with the Trisolarians is a mere distraction compared to the threat posed by the sophons. The threat is clear enough that the nations of the world join in a global defence pact, giving the UN political and economic powers it has never before enjoyed. Given the vast gulf between human and Trisolarian abilities, it is not clear what good even global cooperation can do. There is one coping mechanism open to the humans, one to which Trisolarians are particularly vulnerable. While the sophons can spy on every conversation, every document, and every electronic file, they cannot read minds and their Trisolarian masters are, for physiological reasons, awful at conceiving and unravelling subterfuges. Even imagining that someone might lie is a challenge for them. A cabal of strategic geniuses might be able to out-think the Trisolarians and as long as they never explained why they were issuing their orders, the Trisolarians might never figure out their grand plans. Thus the Wallfacer Project: four men, Wallfacers—retired American Defence Secretary Frederick Tyler, Venezuelan President Manuel Rey Diaz, Nobel winner Bill Hines, and astronomer/sociologist Luo Ji—are granted unlimited power, in the hope that one of them will think of a way to defeat the Trisolarians. There’s an even worse possibility; that the centuries it will take for the Trisolarians to arrive on Earth will undermine the global will to cooperate and resist. Despite being faced with almost certain defeat, the humans might convince themselves that their meagre best will surely defeat the enemy. Such false confidence will ensure defeat. This book had odd pacing issues. I found the first two thirds, when humanity is laying the foundations for defence, a bit of a slog, but the last third, set after a long jump in time, moved at a brisker pace. I had pretty much the same issues with The Dark Forest as I did with Three-Body … which is that vast swaths of it feel more like pulp era SF than they do modern SF. This is particularly true whenever Liu explains the super-science behind the various gadgets. (Shades of E. E.“Doc” Smith!) Not that there’s anything in this volume quite as unbelievable as the orbital mechanics in Three-Body Problem. One further black mark (at least from my POV) is a foolish human strategy that is both ludicrous and unnecessary. Concentrating human military resources invites a stunning first strike against those resources. Moreover, any reliance on known, conventional countermeasures on the part of the humans is foolish; the Trisolarians are so far advanced that our biggest weapons amount to a damp squib. When Hero came out in 2002, some unsympathetic observers thought it was an apologia for totalitarianism. I admit that there were moments where I wondered whether the book under review was such an apologia. Democracy and egalitarianism are not painted as particularly effective in an existential crisis. Of course, given what we see, even a completely regimented society under a semi-divine leader would have proved just as ineffective as the compromised version the UN and the Wallfacers evolved. Ah well, arguing for regimentation and a prudent restriction of rights is nothing new in SF. I am willing to cut the author slack when it comes to the Trisolarian weapons, because he is trying to convey what it’s like being on the short end of what Iain Banks called an Out of Context Problem. Simply giving the Trisolarians weapons that are better versions of devices we can imagine or worse, have actually built, won’t do. That means venturing into regions that appear impossible according to what we know, because the Trisolarians are in command of sciences far beyond any they allow us. The Dark Forest’s title comes from the author’s explanation for the Fermi Paradox. We don’t see aliens, the novel argues, because conflict between two intelligent species is almost certainly guaranteed by the difficulty of establishing trust between them. Since any two species will likely enjoy very different levels of technological sophistication, conflict likely means the swift extermination of the less advanced species. The prudent thing to do is stay as quiet as possible . It’s a reasonable model, so perhaps it’s too bad we’ve made deliberate efforts to be heard. The philosophical discussion reminded me of Pellegrino and Zebrowski’s 1995 The Killing Star. Which, I will point out, isn’t pulp era, but is a full two decades old at this juncture. Liu takes his plot in a different direction than Pellegrino and Zebrowski did. In the process, Liu both surprises and intrigues me enough that, all my griping aside, I’m anxious to see the final volume, to find out how it all works out. The Dark Forest is available from Tor. 1: Delaying translation by seven years granted this novel a few History Marches On embarrassments. Not that such are unknown to SF. Niven’s story featuring a tide-locked Mercury was published after that model was disproved (publishing delay, not Niven’s fault). And there are all those books featuring the Soviet Union that came out in 1992. In this book, there’s a scene involving a quite well known terrorist who … ah … lost his effectiveness about four years before the English edition appeared. 2: My great work, James Complains At Length About Works that Won the Hugo is, sadly, an as-yet-unfunded effort. I will therefore limit myself to one small kvetch, namely: “How could the 1982 Hugo voters have given an award to “The Saturn Game” by Poul Anderson, a story which was competing with such gems as “In the Western Tradition” by Phyllis Eisenstein, “Emergence” by David R. Palmer, “Blue Champagne” by John Varley, “True Names” by Vernor Vinge, and “With Thimbles, with Forks, and Hope” by Kate Wilhelm … how could an informed electorate pick Anderson’s story, the one story whose moral is “don’t enter highly delusional states while exploring alien worlds”? WTF, voters back in 1982??? 3: I wonder if it is even possible to hide. Calculations suggest that the majority of our electromagnetic emanations fade into noise before they reach the nearer stars, but there is no way to hide the signs of industrialization and nuclear capability floating in our atmosphere. Indeed, humans don’t need advanced technology to have had a dramatic and detectable effect on the atmosphere. Granted, the speed of light gives us some breathing time. Unless, of course, it doesn’t.